Washington - President Barack Obama’s re-election campaign is suing a website that sells T-shirts, bumper stickers and buttons with the campaign’s signature “O” logo, claiming the store is infringing on its trademark. 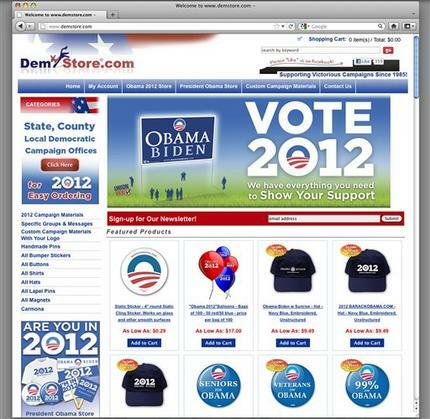 Lawyers for the campaign are asking the court to stop Demstore.com from using the logo and award damages. The lawsuit says the campaign is being harmed by the sale of the competing items. That’s because the campaign makes money from merchandise sales on its own website and doesn’t get that money, which is considered a campaign contribution, when people buy the items on another site. The campaign also misses out on a chance to get the contact information of people buying the merchandise - information that is used for future fundraising efforts. “I think people prefer to have the freedom to buy the merchandise where they want to,” Schwat said. Obama’s campaign filed a nearly identical lawsuit against Demstore.com in October 2011 in Chicago, but that lawsuit was voluntarily dismissed in January. Washington Promotions & Printing had argued the lawsuit was improperly brought in Illinois. I suspect for a self-described "shmutz", violation of copyright laws is OK for little guys. Unfortunately, the courts think otherwise and he will be properly shut down. Copyright infringement is mamash ganavah. Would you think its OK to copy the logo of this website or any other intellectual property but argue its "ok" because your a little guy?? While that is funny... and ironic, the reality is that a campaign sells merchandise in order to make money for the campaign. That's why we have intellectual property rights. That is why you can't buy a CD, make 100 copies of it and sell them out of the trunk of your car. It is like you opening up a store selling "Make A Wish Foundation" merchandise. People will buy it because of the name, assuming that the foundation gets the money. Or you could setup a stand outside selling Special Olympics tee shirts in Manhattan and make a killing on them... you would certainly see how that is stealing, so too is using the Obama campaign logos. No matter what you think of Obama, what these guys are doing is illegal, and infringement. who would buy this crap? "...i still laugh every time I drive and see someone with a obama/biden bumper sticker on their car." Oh I know what you mean! Thinking back to how we almost handed this country over to a complete ignoramous, one heart-attack away from being President, and almost gave away the nuclear codes to a woman who couldn't even name foreign heads of state, is TOTALLY laughable to me as well, every time I see a McCain\Palin bumper sticker on the back of somebody's car! You do what you gotta do when your campaign is strapped for cash. “ "...i still laugh every time I drive and see someone with a obama/biden bumper sticker on their car." I suppose the McCain\Palin bumber sticker makes a point that the driver has no responsibility for the current mess since he voted for McCain. The Obama bumper sticker communicates the opposite message. The Obama 2012 bumper sticker shows support for further deterioration of this country. Funny how the cash from t-shirts mean more to Obama than free advertising of his campaign. No sane person will buy a shirt for 30 bucks, but 6 dollars is reasonable. He could have thousands of people walking around wearing his message. what an idiot! it will take years before they see any cash. by that time, the election campaign will be over. so who pockets the money?? It would seem to me that both groups are deluded. Those still driving around with McCain/Palin stickers are showing that they didn't care about the 8 previous years and didn't care that McCain chose an imbecile that made Dan Quayle look like Einstein to be his running mate. Those with the Obama/Biden stickers on their cars are equally deluded. They are still hoping for some kind of miracle to turn this economy around. They think that just because Obama is the smartest guy in the room and is a "nice guy" that he can fix their problems. That is NEVER the case. Smart and likable does not mean problems just go away because we all "feel good". Nixon was a jerk and of lower intelligence and he was one of our nation's greatest leaders. The only people who should be proud are those driving around with BOB BARR bumper stickers. We are the ones who realize how different things would be if talk radio entertainment hosts, and cable news entertainment shows weren't deciding our candidates for us. “ It would seem to me that both groups are deluded. I voted for Bob Barr because the other 2 choices weren't palatable. Palin is not an imbecile but a very shrewd woman who has capitalized on her limited abilities and made herself a household name and a lot of money much the same as Rev Al Sharpton. They are both laughing all the way to the bank. Quayle is a true moron. You must be living in a parallel universe. EVERY poll shows Obama is up. Real Clear Politics (one of the organizations that aggregates polls from across the spectrum) typically has the closest numbers. Today, Obama is at 47.5% and Romney at 45% nationally. Obama is still ahead in FL by .3%. Romney cannot win the nomination without Florida. I would suggest that you stop repeating the silly propaganda you hear on radio and TV and arm yourself with some FACTS. The only way to defeat Obama is to start telling the TRUTH.... something the radio and TV entertainers abandoned years ago. "No sane person will buy a shirt for 30 bucks, but 6 dollars is reasonable." Unless they cared about buying t-shirts from here in AMERICA.